A core tenet of using public cloud for IT infrastructure is the ability to pay only for what you use. With this in mind, we’re pleased to announce that the suspend billing feature for IBM Cloud virtual server instances will be generally available across IBM Cloud data centers worldwide mid-October 2018. This allows for more granular billing and the ability to suspend billing altogether by powering off. Up until now, the only way to suspend billing was to terminate your instance. For intermittent use cases, this would mean reprovisioning and reconfiguring network settings each time, which is rather impractical without automation. And for some use cases that require large batch orders, reprovisioning can just simply take too long. As a result, many choose to leave virtual servers running—paying the bills to keep them running even when they know they won’t need them. 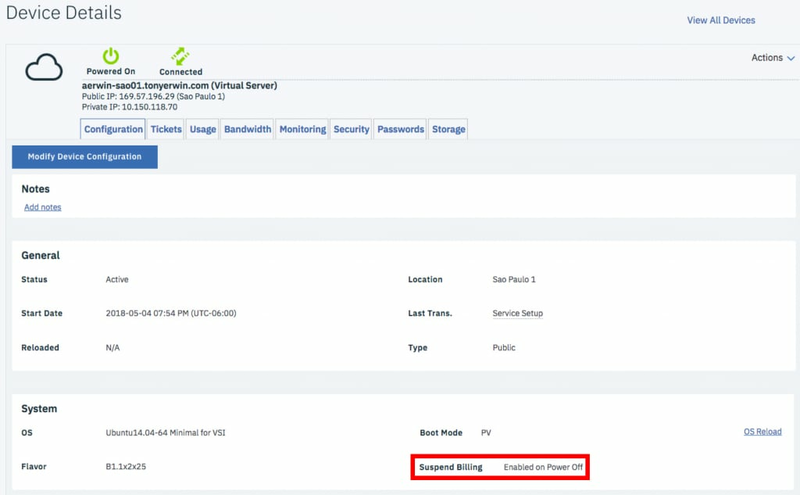 The new suspend billing feature for IBM Cloud virtual servers fixes this by allowing you to have the best of both worlds: quick and easy resumption of workloads without paying for idle time. Note: Any attached persistent storage, 100GB primary volume upgrades, and secondary IPs will continue to incur charges. However, while we suspend billing, we don’t deallocate your instance from its host. While you’re powered off, we make the host resources available for IBM Cloud Transient server instances. But, we remove those temporary guests when you turn your virtual server back on. This means your time to resume is fast, and from the perspective of the virtual server, it’s a simple boot after a power-off. When powering your virtual server back on, you can expect to have it fully accessible within about two minutes. Depending on your boot image, it could be as fast as 30 seconds. In general, the time to resume will be at least twice as fast as provisioning from scratch. Another advantage of this new feature is that all of these events are measured based on the minute, not the hour. This includes both the lifecycle and power on/off events. So your invoice is always calculated with one-minute granularity, regardless of whether you use the suspend feature. IBM Cloud suspend billing will be available on hourly public flavor sizes with SAN-backed storage. Your existing IBM Cloud virtual servers will not inherit this functionality, meaning suspend is only available on newly provisioned instances. Another important note is the minimum usage charge of 25%. At the end of the billing cycle, you’re either charged for the time you used or 25% of the time the instance existed during the period (from provision to reclaim), whichever is greater. The idea is that if the virtual server is hardly used, it will still incur a nominal charge because the capacity was reserved. For more details about our suspend billing and one-minute granularity features, please see our IBM Cloud virtual server documentation.